Moving house doesn't need to be stressful with Greens Removals! We offer a full range of high quality removals and storage services for UK household moves. Using our UK removals service will get you and your belongings safely installed in your hew home as quickly and smoothly as possible. Greens Removals are BAR registered and all of our staff are highly trained to ensure the safe delivery of your cherished belongings. Removals and Storage UK - click here for a removals quote. As soon as we receive your removals enquiry, one of our experienced consultants will plan a visit to your home and establish your individual requirements. Greens Removals will then provide an all inclusive, written household removals quotation clearly outlining all services. Door to door, or door to store, we can also arrange removals storage UK and worldwide. 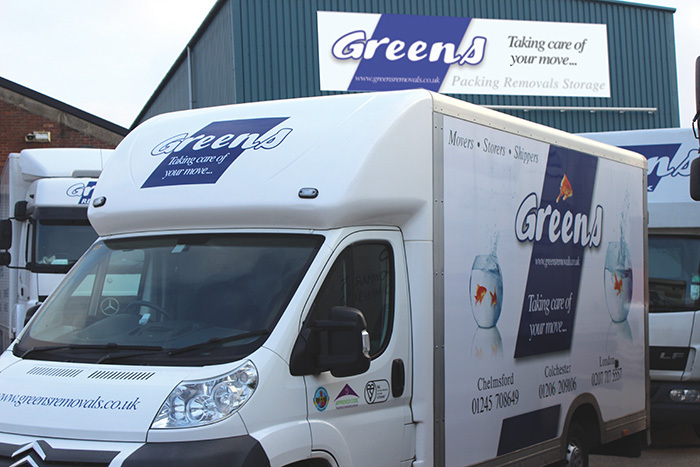 As a leading UK removal, storage and packing company, Greens offer a comprehensive range of UK removal services including packing and unpacking services, specialist removals and removals insurance. We provide free household removal quotes, to give you an estimate of your moving costs. Our sales office will arrange for one of our surveyors to visit your home and discuss your requirements to ensure that we are fully aware of your needs and can tailor make our quote to meet your needs. Should you choose to use our removals packing service, there are a number of options that you may consider We only use the highest quality packing materials and have a vast range to suit any requirements you may have. Our full packing service includes the professional packing and wrapping of your china, glass and kitchenware. As well as books, linen and miscellaneous effects into specialised removal cartons. Paintings and mirrors will also be packed using appropriate materials. This service includes the professional packing and wrapping of your china, glass and kitchenware - the most delicate items which need extra protection during your household move. Moving kit (boxes and tape) will be provided for you to pack all other remaining items. These will be delivered on request subject to our vehicle schedules. Wardrobe cartons will be provided on the day. A moving kit (boxes and tape) will be provided for you to pack all your items. These will be delivered on request subject to our vehicle schedules. Wardrobe cartons will be provided on the day. We request that all packing is completed prior to the arrival of our crew to avoid delays and possible additional charges. Any boxes packed by our staff on the day of the removal will be charged at £6.00.